Last night the creative muse was out in full force resulting in a very productive evening. I painted a few octopus pendants, made a lovely green jasper bracelet and painted a new piece. Lots of things have been known to spark my inspiration as it goes for most artists, but for this piece I was thinking of the ocean, missing the Atlantic, I had just finished “Washed Away” and had just sold “Industrial Wash” over the weekend. So I started this piece knowing that I wanted to use a blue brown palette with the sea in mind and went from there. I’ve called it “Be Still” as it reminds me of the story in the Gospels of Jesus calming the storm at sea. 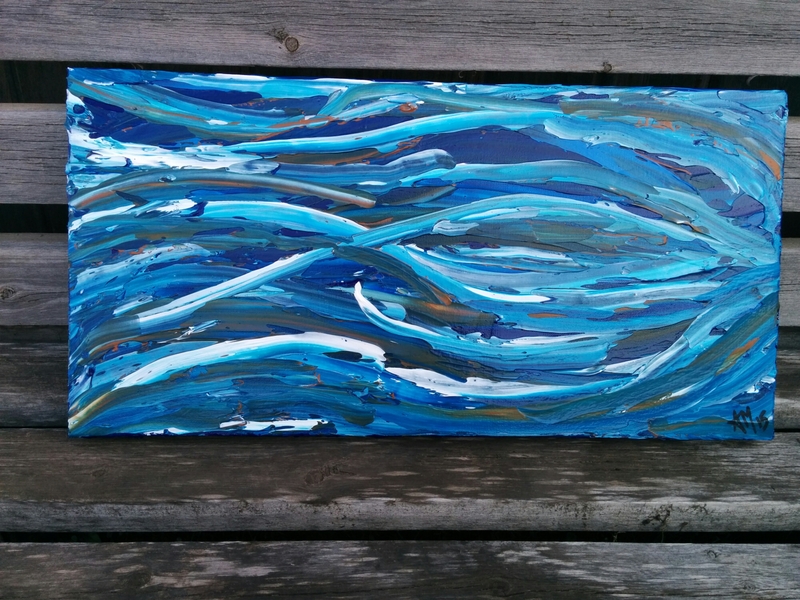 This entry was posted in 2015 Artwork, Abstract, acrylic, Art, canada, canvas, Christian Art, Christian Themes, female artist, For Sale, Fort Saskatchewan, God, God/Religion, paint, Paintings, photos and tagged 12" x 24", Abstract art, abstract painting, Art, Be Still, Bible, Blue and Brown painting, Christian Art, Gospel, Jesus calms the Storm, ocean, Sea, Water on June 3, 2015 by Amanda.